MERV. MPR. FPR. Just 10 little letters can make a simple filter shopping experience seem more difficult than it should be. To sum it all up, these three acronyms are all meant to do one thing: rate filters. 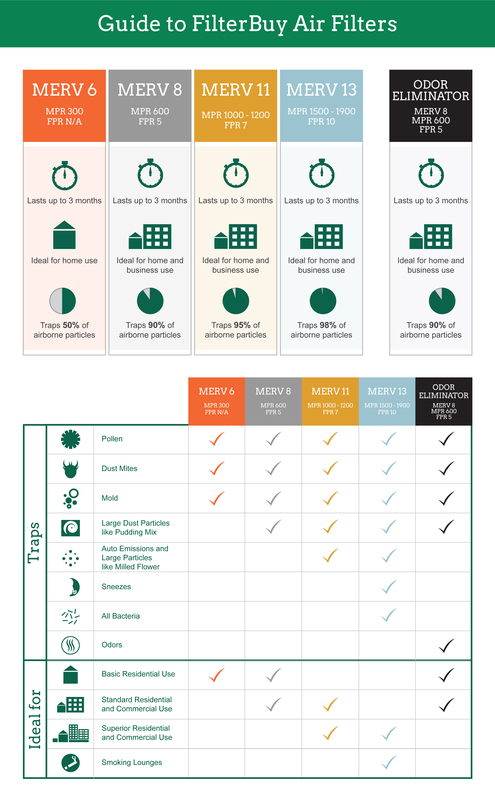 If you’re trying to make sense of how MERV, MPR, and FPR ratings compare, FilterBuy is here to help! The guide below provides an overview and comparison. The quality of an air filter is assessed by its rating, which tells you what the filter blocks. The higher the rating, the smaller the air and dust particles your filter can capture. MERV, MPR, and FPR rating systems consist of a range of numbers that represent the filtration effectiveness. Below, we’ll break down where the rating systems come from and how to use them when shopping for your next filter. Every furnace filter in the US carries a MERV rating, which is the only nationally regulated rating system. Established by the ASHRAE (American Society of Heating, Refrigerating, and Air Conditioning Engineers), the MERV rating system specifies a filter’s ability to capture air particles and pollutants. MERV ratings run on a 1-20 scale that designates the effectiveness of filters to capture certain particle sizes. The higher the MERV rating, the more particles it captures. If the MERV rating is too high (above MERV 13), however, it can increase system backpressure and block air flow, worsening the effectiveness of your HVAC. To learn more about MERV ratings, click here. Created by 3M, only filters designed by the 3M/Filtrete brand carry an MPR rating, which rates the filter’s ability to trap air particles smaller than 1 micron. MPR ratings range from 300 MPR (Basic) to 2800 MPR (Premium). Created by The Home Depot, only brands sold in The Home Depot stores (including Honeywell filters) carry an FPR rating. This rating system was established to provide a unified ranking system, but lacks specific figures in order to keep simplicity. A number scale from 4-10 and color code is used to rate the filter’s quality and ability to trap certain particles. Have more questions about MERV, MPR, and FPR ratings? Our filter experts can help you. Contact us today!